I’ve been a consistent advocate of road handlebars for bicycle travel for some time. I really like the near/far/high/low hand locations, as well as the slightly different wrist angles. But a handlebar called the Velo Orange Casey’s Crazy Bar recently piqued my interest – so I bought a set. This weird-looking ‘alt’ handlebar is a unique combination of a bullhorn and swept-back flatbar. The 400mm wide bullhorn section offers a stretched-out, aerodynamic position similar to the brake ‘hoods’ on a drop handlebar. The centre portion replicates the ‘tops’ of a drop handlebar. And this is all mated to a 45-degree sweptback section that is both ergonomic and wide for additional steering stability. The Crazy Bar is constructed using heat-treated aluminium which is fine for touring, but not intended for mountain bike use. That said, Velo Orange produce a steel version that is MTB-rated. Weight is very reasonable at 450 grams. That makes these bars lighter than many alt handlebars including the Jones Loop in both titanium and aluminium. The Crazy Bars come in both black or silver and can be purchased for just US $60. Head HERE to see all the different kinds of alt handlebar available. The Perfect Replacement for Drop Handlebars? 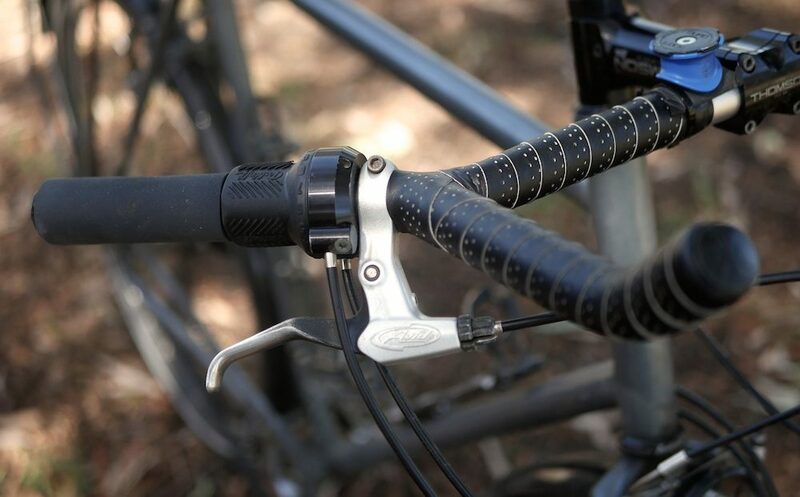 The Crazy Bar is a little different to other ‘alt’ handlebars: it’s optimised for bikes that come with road handlebars. Ok, let me explain. Frames designed around road handlebars are ideally shorter than those with flat handlebars. This is because the distance you have to reach to access the brakes is about 50mm further on a road handlebar. 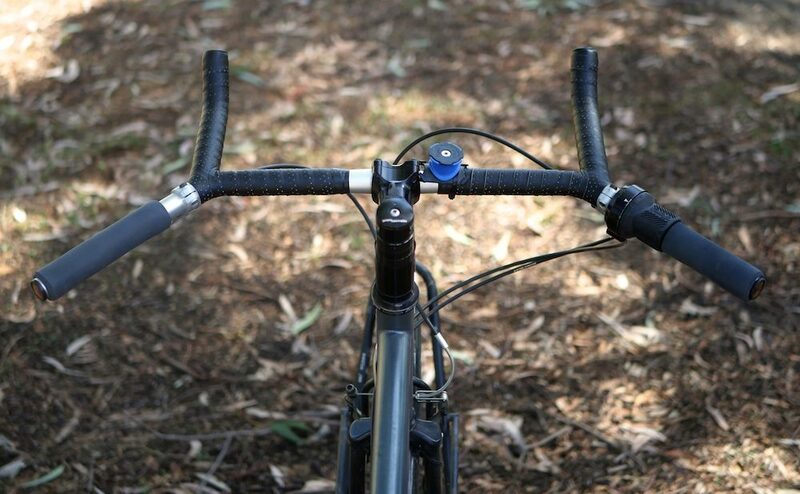 Therefore, to get the same overall ‘reach’ we need shorter frames to compensate for this handlebar discrepancy. In fact, Salsa offers their Marrakesh touring frames in both a flatbar and dropbar design to make sure you achieve a comparable overall reach with your desired handlebar. Given that the bullhorn section of the Crazy Bar matches the brake hood position of a road handlebar, these bars tend to be best fitted to a bike that currently uses road handlebars. 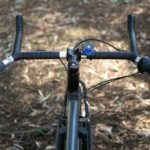 If you’re thinking of fitting these to a bike that comes with flat handlebars, you’ll need to lop more than 40mm off the length of your stem to compensate. 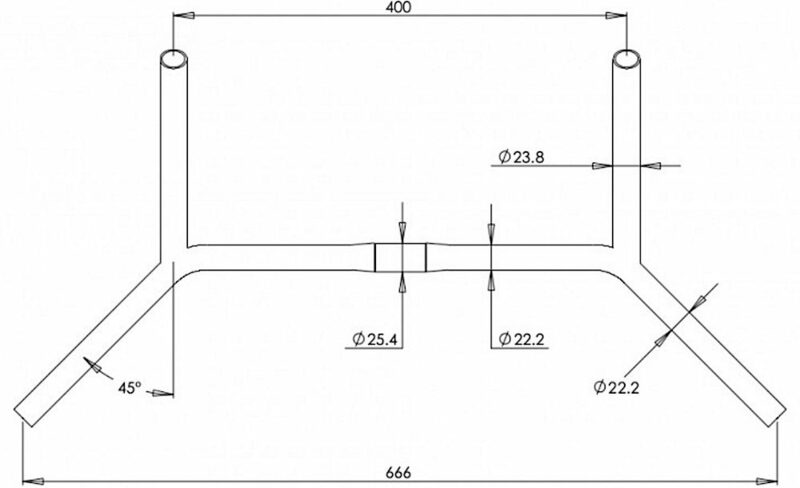 The total width of the Velo Orange Crazy Bar is 666mm. I’ve found this width to offer as much handlebar leverage as I need to tackle even the roughest dirt trails. The distance between the bullhorns is 400mm which feels really natural for me as a rather oversized human. They’re probably going to be on the wide side if you’re a small female, however. The sweptback section is the same 22.2mm bar diameter as a regular flat handlebar, fitting MTB shifters, Rohloff shifters and all the standard hydro or cable brake levers. The 22.2mm bar diameter extends to the ‘tops’ where it permits you to fit Paul ‘Thumbie’ shifters that use a hinge-clamp design. The bar diameter of the bullhorn section matches that of the ‘drops’ of a road handlebar. You can fit barend shifters to the end of the bullhorns, or perhaps even inverse brake levers (like those on a time trial bike). The handlebar clamp diameter is 25.4mm. This is the old MTB size while current stems are 31.8mm. Not a huge deal, but it did mean that I couldn’t use any of my spare 31.8mm stems. When I installed the Crazy Bars I found the stem position to be rather different from how I like my road handlebars. My final position is about 50mm lower and I’ve switched the stem to a model that’s 20mm shorter. This is because I’ve opted for a bar height somewhere between the height of my ‘hoods’ and ‘drops’ of my road handlebar setup. As this lower height increases the reach to the handlebars, I’ve reduced the length of my stem. I originally had the Crazy Bars setup to be completely horizontal. This worked out well when using the bullhorns, but the 45-degree section put too much stress on my wrists after a few hours. I rotated the handlebars back and they’re now sitting at 11-degrees from parallel. I don’t like the bullhorn position as much in this location, but my wrists don’t complain in the sweptback position. Compared to my road handlebars, the Crazy Bars offer so much more control. 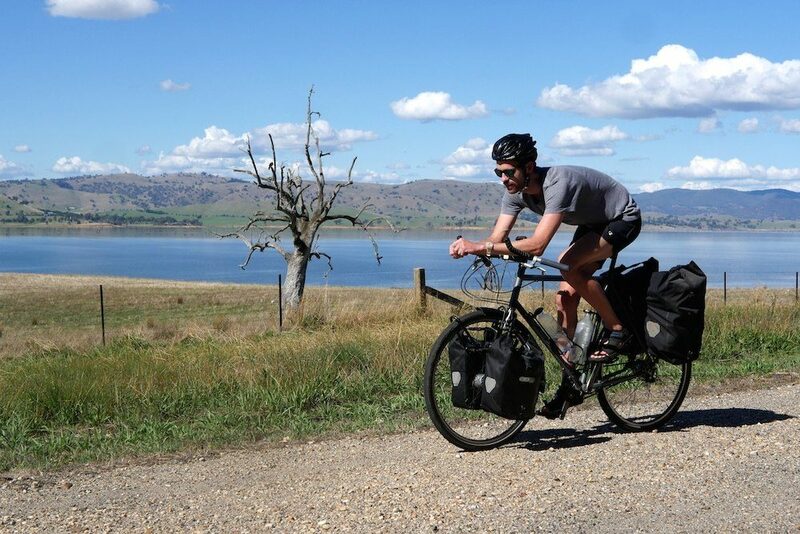 I’ve found I can really load up my front panniers, and be able to steer them with precision on some really rough sections of road. This can be attributed entirely to the additional width on offer. I have a whole series of articles on this website dedicated to mating MTB derailleurs with road bike shifters to achieve lower gear ratios. I have a page which shows you all the ways to mount a Rohloff shifter on a road handlebar. I talk about the benefits of barend/friction shifters in multiple sections too. But all of these are irrelevant workarounds when it comes to the Crazy Bar – just fit your MTB derailleurs with your MTB shifters and enjoy. Brake cable changes are a real pain on road handlebars because the brake cables run underneath your bartape. With regular v-brake levers, you can open up the brake cables for a quick lube in a matter of seconds. My brakes have never felt snappier! The Surly Moloko looks to be a pretty similar handlebar to the Velo Orange Crazy Bar. 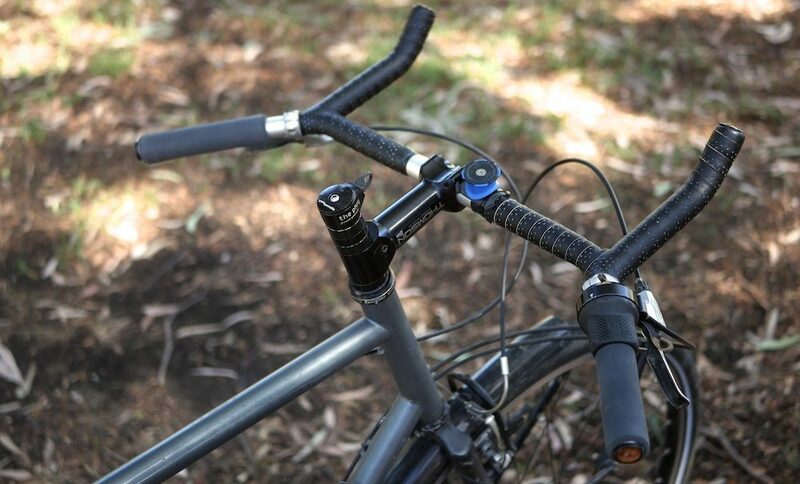 Both of these alt handlebars offer a ‘bullhorn’ type section out front to give a similarly extended reach. The rest of the handlebar is quite different though. In the sweptback position, the Moloko has a longer reach due to its 34-degree sweep angle. It’s also 7cm wider overall. There’s not really a ‘tops’ section on the Moloko as there is with the Crazy Bar, but the Surly has its equivalent albeit ~15cm further forward. Otherwise, the Moloko has more space for accessories, but it won’t take a handlebar bag due to the cross bar. A few trips ago I couldn’t imagine riding a bike without road handlebars. But after 4000km+ on the Crazy Bars, I have zero intention of switching back. I’ve still got my aerodynamic ‘road’ position in the form of the bullhorns. The only thing I really miss about my old drop bars is the bike aesthetic, but I’m almost over that now. The Crazy Bars have got to be the most versatile bar option. The extra width makes descending on rough roads easy, even with heavy front panniers. The narrow bullhorn section allows you to cut through the wind. The 22.2mm bar diameter takes away the need to do any workarounds when matching MTB derailleurs with road shifters. Here’s to the next 12-months with the Crazy Bars.